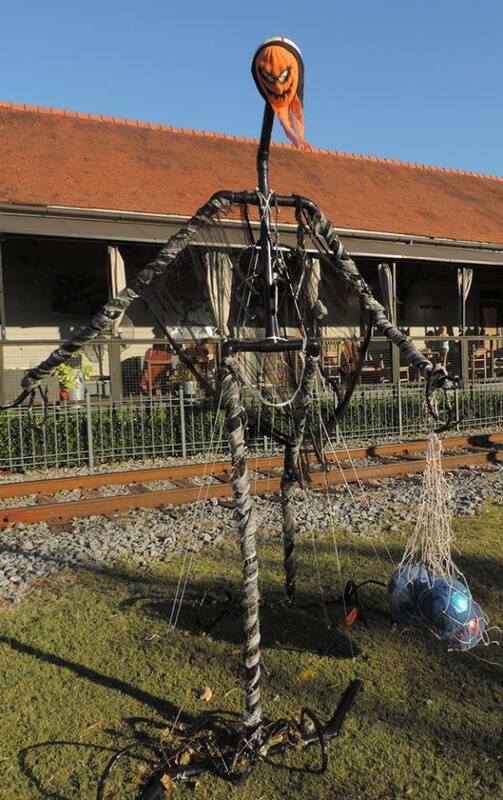 Planning for one of downtown Woodstock’s favorite seasonal events is underway − the Scarecrow Invasion. During October, just in time for Halloween, dozens of scarecrows line the streets of downtown Woodstock. Individuals, nonprofits and businesses have the opportunity to be a part of the annual invasion and showcase their creative skills. The proceeds from the Scarecrow Invasion are donated to GROW (Green Reaps Opportunity for Woodstock), the design committee for Main Street Woodstock. It creates and implements design initiatives for the downtown community, such as landscaping and holiday decor along Main Street. Proceeds from past years of the Scarecrow Invasion were used to purchase art benches that can be seen located around downtown. Registration for the invasion begins 10 a.m. Sept. 4, at the Woodstock Visitors Center, 8588 Main St., Woodstock. You can pay the registration fee, pick a spot, and receive the rules and instructions for installation and voting. Last year, the event sold out in less than two days, so enter early. Voting will also take place at the Visitors Center. Drop by during October to vote for your favorite scarecrow. Votes are $1 each, and businesses with scarecrows may set up voting in their store or office. The winner receives bragging rights and a trophy. This year, there are some changes to the event. Locations, display guidelines and pricing have been updated to ensure the Scarecrow Invasion remains a fun, vibrant event. Due to streetscape improvements, there will no longer be scarecrow displays along Arnold Mill Road. There will be spaces added to the area around Market and Elm streets, to allow for as many businesses and individuals as possible the opportunity to participate. Spaces that were added on Chambers Street last year will be available again, for pedestrians and motorists to enjoy. Structures, such as buildings, photo booths, etc. are no longer permitted. Unfortunately, many of the structures from last year sustained wind and weather damage, requiring additional monitoring from staff and volunteers. Also, hay bales and natural pumpkins are prohibited to avoid rot and decay. New pricing is in place for this year, based on location. For businesses, spaces with the most visibility, specifically those on Main Street, are $100 with all other locations $60. Spots for nonprofits and individuals are $40, regardless of location. Last year, downtown Woodstock was full of creative scarecrows, and we want this event to be bigger and better this year, making our city the destination for Halloween fun. For additional information, contact Stacy Brown, marketing manager, Woodstock Office of Economic Development. 678-217-2386. sbrown@woodstockga.gov.